We live in an age where Elon is planning humanities voyage to Mars, so having a WiFi-connected smart home is the least we can do to keep up! It’s time to… well… get with the times and it’s never been easier with everything from your washing machine to your toothbrush now available in a smart version. …and no smart home is complete without a stylish set of IP cameras feeding you a live stream of your home from anywhere in the world at any time. Spying on your cat just became a thing and it’s so much fun, not to mention the added security benefit. 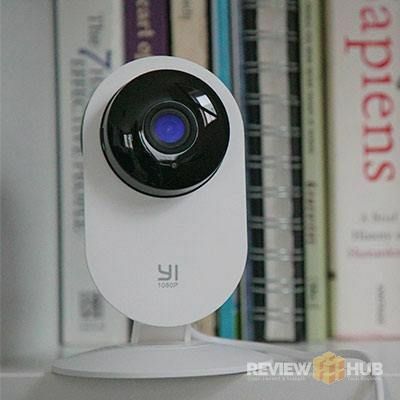 Here at Review Hub, we bagged ourselves a couple of the Yi Home IP Cameras which both come with 1080P streams are compatible with the easy to use Yi Home app. The Yi Dome Camera (1080P) takes it a step further by having full motion tracking built-in and full 360-degree vision via the pan and tilt controls. 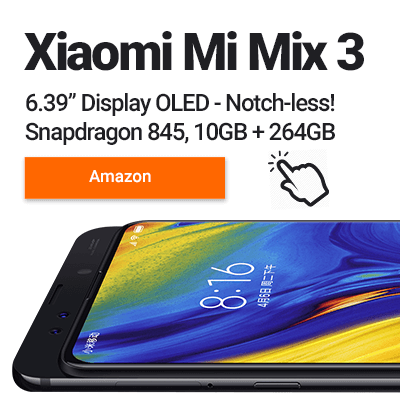 If you haven’t heard of Yi before, you’ve might have heard of Xiaomi (…huge Chinese tech company…) who bought out Yi Technologies after being impressed by their tiny camera technology. If you have heard of Yi Technologies, then you’ll most probably know them for their range of GoPro like action cameras rather than there recent venture into the home security market. With the help of Xiaomi’s software expertise, they’ve now created a whole range of Smart WiFi security cameras (indoors & out). I’ve been using both cameras (Yi Home 1080P & Yi Dome 1080P) for the last couple of weeks looking in-depth at the Design, Build Quality, Video Quality & Features so I can let you know whether they’re worth your hard earned cash… or… whether you should look elsewhere. The 1080P Yi Home camera is the 2nd version (there’s now a Yi 1080P with 25fps) which comes with, as the name suggests, an improved resolution of 1080P but also has extra features such as lens distortion correction, 2-way audio and a new baby crying detection mode. I can see the Yi Cameras being attractive to people with young children. 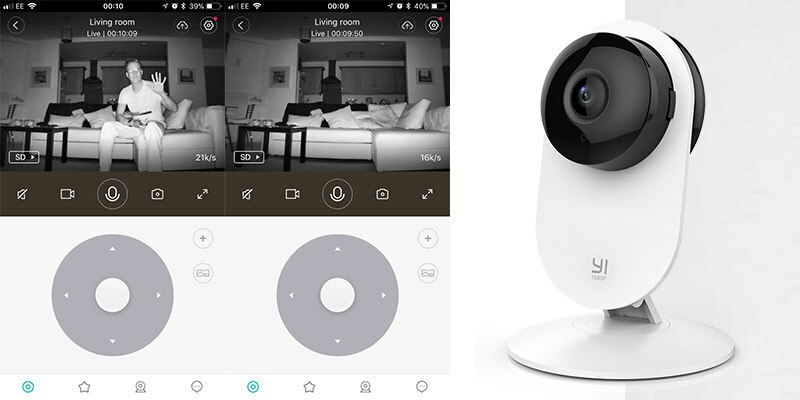 As the Yi Home Cams have a Baby Cry Alert mode, are night vision ready and also have a two-way audio system they’re a great all-in-one solution for keeping an eye on the little ones. It might not replace your baby monitor, but it’s a hell of an upgrade! Another big selling point for the Yi Cameras is so that you can spy on your pets when you’re bored at work… Just kidding, it’s for the added security and peace of mind you’ll get from knowing your home is safe & secure. If you’ve ever been stressed about your home while on holiday or even at work, the Yi cameras will help to put your mind at ease. Both Yi Home & Yi Dome have motion & sound detection built in. Using the Yi Home app you can setup an alert that will tell you when someone is in your home. You can then go on to customise how these alerts are triggered if you get false alarms. In the case of a real alarm… if you’re really brave, you have the option to use the 2-way audio system to confront the intruder… maybe ask them to politely leave, shout your worst insults or probably best… just stay quiet and call the local authorities. Before testing out the motion detection mode I adjusted the sensitivity to the highest level in the Yi Home app. I then tested it out by entering the room multiples times using my best ninja stealth mode (both with the light on and off). I can safely say that my Ninja skills aren’t good enough to fool the Yi Camera as every time I was sent a motion alert straight to my Apple Watch. The night vision mode also exceeded my expectations with the 8 x 940nm infrared LED bulbs really helping to make the image clearer. The infrared works well to around 5 metres so if your rooms a lot bigger than this you might struggle to see the far edges clearly. Now onto the cooler, albeit less discrete, Yi 1080P Dome Camera. It has all of the features of the 1080P Yi Home cam but with the added benefit of pan & tilt functions enabling you to view a full 360 degrees area. You can setup 8 preset bookmarks and the Dome cam will automatically focus on these points when selected in the app. You can also send the Dom cam into patrol mode (auto cruise) where it will scan around the room looking for motion. Finally, the Dome cam when not in use goes faces the camera against the plastic cover, giving you 100% privacy if you need it. The 1080P camera quality on both the Home & Dome is excellent. The frame rate isn’t the fastest at 15fps, but you can now get the Yi Home 1080P (2) which comes with an improved 25fps. Night vision worked really well in my living room with the infrared LEDs working to show a clear image. One downside is that when zooming in for a closer look on my mobile, the image did become rather pixilated. 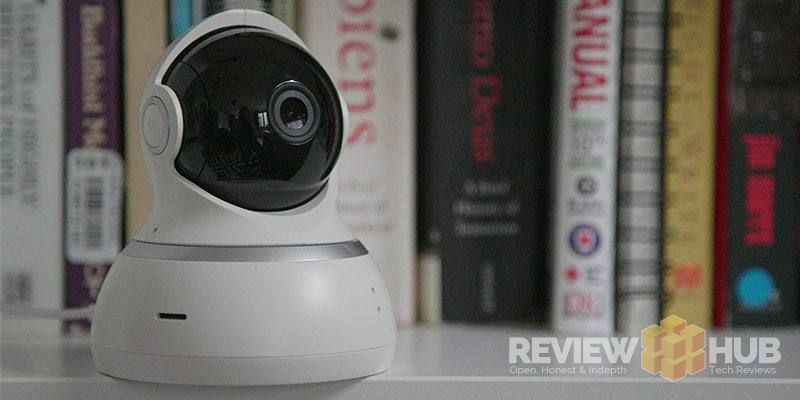 For home security, it’s more than good enough, but if you need to be able to zoom in, with detail, you’ll need to go for a cam with either a higher resolution or optical zoom. Setup is very straightforward, just download the app ‘YI Home’ in either the Apple App Store or via the Google Play Store. There’s even a QR code in the setup guide, but it’s just as easy to search. 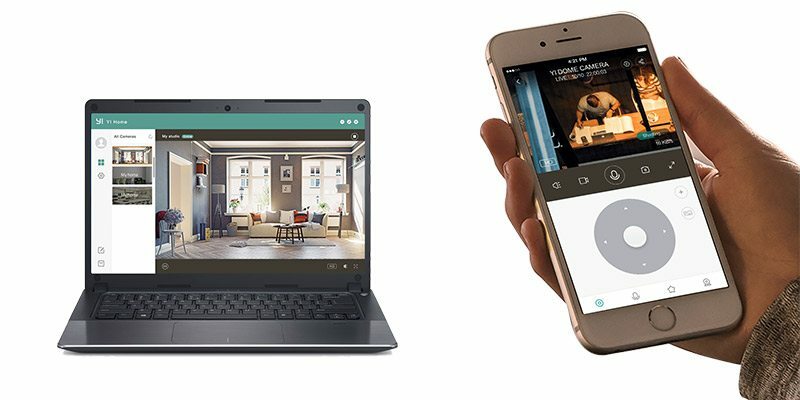 First set yourself up on the Yi Home App, login and then plug the Yi Home Camera in. The Yi Home app will then display a QR code which you show to the camera. That’s it, the cameras are no connected and ready to be controlled / setup via the app. The app is super easy to use, the main home page lists your cameras and each one can be assigned a custom name to help you keep track of them. You can setup a max of 12 devices per account. The alerts function lets you choose which activity you want to receive notifications for whether its motion, baby crying, motion tracking or all of the above. The settings page lets you turn the devices on and off, adjust sensitivity levels, add pin protection and change the cloud storage settings. The watch function lets you see a timeline of all the activity that has occurred throughout the day. Areas where activity have been detected are highlighted for quick viewing with the app being easy to use. I did have a couple of occasions when I was out of my home where the app became slow, but this could be due to the WiFi I was using. I’ll test further and update. 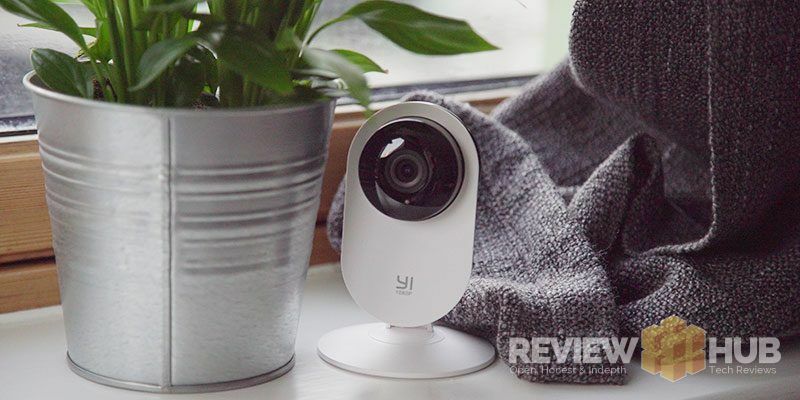 Yi are also releasing regular security and firmware updates for their range of cameras which can be found on the official Yi Technology website. The real stunner is the Yi 1080P Camera which looks fantastic. The camera is suspended between the single oval shaped piece of plastic and doesn’t give off a home security feeling at all. It looks more like a fancy webcam that’s been left out. 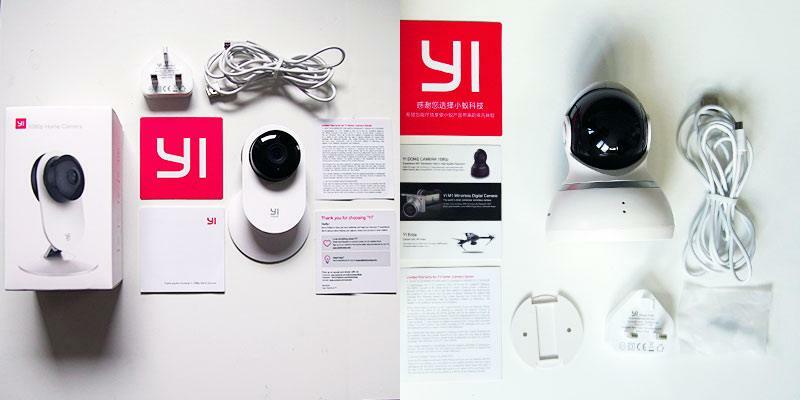 Both the Yi Cameras come with an instruction manual, quick start guide, UK USB Wall Plug, USB Cable and the Yi Camera. The Dome camera also comes with a mounting bracket and screws so that you can place it horizontally or upside down. 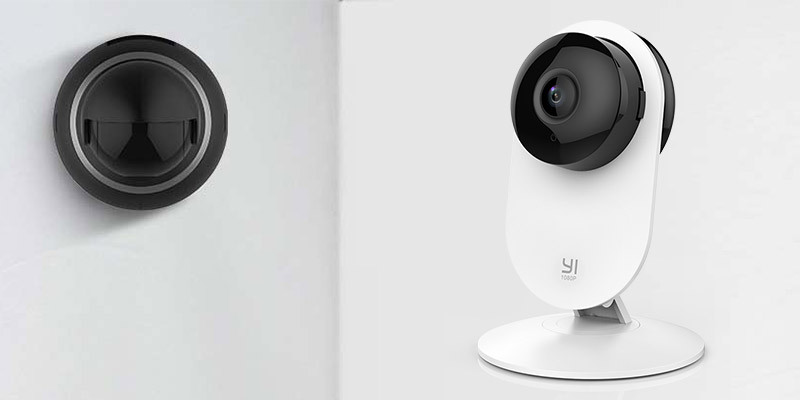 The Yi Home 1080P camera can also be placed on the wall but doesn’t come with the attachments. Overall I’ve been impressed with the Yi Home Cameras. The App is very easy to use with the setup taking only minutes. 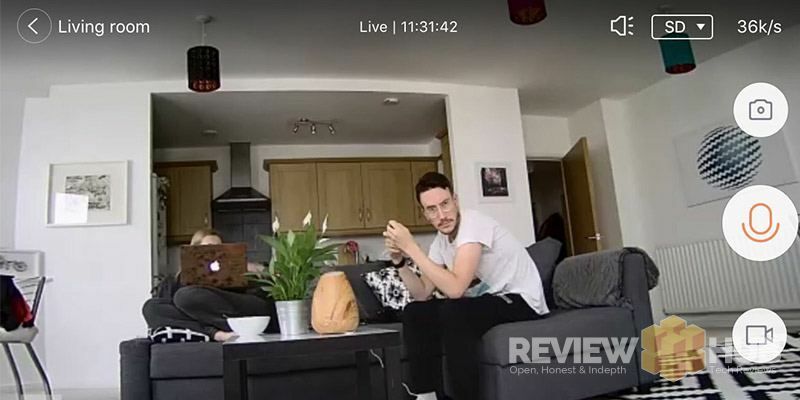 Whether it’s just to check on your cat or whether it’s for peace of mind, having access to the camera feeds on any WiFi or 4G network is really cool. The frame-rate on the cameras I tested did feel a little low at 15fps but you can now get the upgraded version which shows a live stream at 25fps. The Dome camera is still only 15fps at the moment. What really separates the Yi Cameras from the competition isn’t the specs or the cool features they’ve baked into their software… for me, it’s the design. 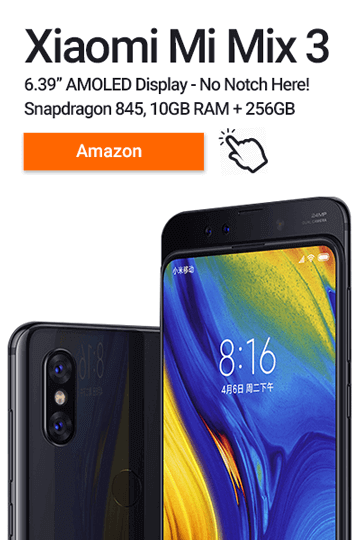 These cameras look great with the understated minimalist design looking very much like a Xiaomi product. Looking for a low-cost home security setup? Check out the latest Yi Camera deals below.